Komtar Gunung Raya (formerly Five Stars Penang) office, conveniently located at the heart of Penang, Prangi Mall of George town, offers daily trip for bus from Penang. This strategic location has bring much convenient to all travelers in Penang who wish to take the bus to various parts of Malaysia. Five Stars Express Penang is a subsidiaries of the Five Stars Malaysia group, which comprises of offices in Jalan Pudu Kuala Lumpur (HQ), 1 Utama Shopping Centre, Genting, Ipoh, Kluang, Muar, Batu Pahat and Yong Peng. The penang company also has another name in Komtar Gunung Raya Agency. 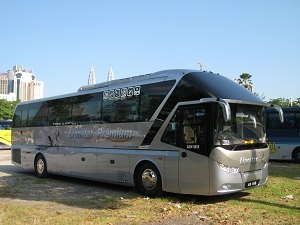 Komtar Gunung Raya offer daily express coach service to various towns in Malaysia, including bus from Penang to KL, Penang to Singapore, Penang to Cameron Highland, Penang to Johor Bahru and many more. 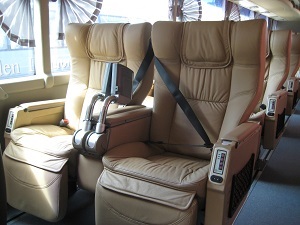 The company also act as an agent for Konsortium Express, Shamisha Express, Mesra Liner Express, SE Super Express, Unititi Express, Star Coach Express and Transtar Express to sell their express tickets for bus from Penang to other cities in Malaysia. Check out for their schedule below for more information or direcly search the schedule from Penang to find out more.